Heavy duty doesn’t have to mean heavy weight. Lighter weight, stronger frame – PX310 delivers more. 44” wide ramps for MAX versatility. 50 ksi steel ramp frames x 4 frames per ramp for MAX strength. HD Spring loaded for easy lifting from deck and from ground. For safe, stable loading. 12’ long with easy to climb, 12.5 degree approach angle. Blackwood rubber-infused runners for traction. Automatic latch for easy operation. Includes wireless remote control. Includes 96" Rear Slide-In Ramps (3" Channel). Single piece bumper with light protection. Max Ramps 28' x 102"Max Ramps 30' x 102"Max Ramps 32' x 102"Max Ramps 35' x 102"Max Ramps 38' x 102"Max Ramps 40' x 102"Hydraulic Dovetail 32' x 102"Hydraulic Dovetail 35' x 102"Hydraulic Dovetail 38' x 102"Hydraulic Dovetail 40' x 102"Straight Deck 25' x 102"Straight Deck 28' x 102"Straight Deck 30' x 102"Straight Deck 32' x 102"Straight Deck 35' x 102"Straight Deck 38' x 102"Straight Deck 40' x 102"
12.5 degree load angle with Blackwood infused lumber included. We design, optimize, and engineer our own patented I-Beams to fit each model. 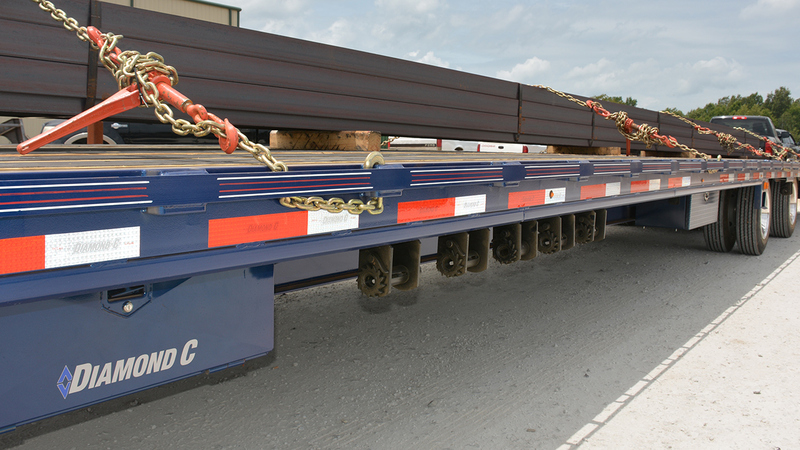 Fleetnecks are stronger yet lighter, featuring the best strength-to-weight ratios of any steel frame gooseneck on the road. Includes dual compressors, one 10V 5amp charger and dual Group 27 continental batteries.